There are a few trigonometric identities you must know for the Mathematics Level 2 Subject Test. Since sin 2 = 2(sin )(cos ), you need to determine the value of sin . From the figure below, you can see that sin . Therefore, sin . 2. If cos 23° = z, find the value of cos 46° in terms of z. Since 46 = 2(23), a double angle formula can be used: cos 2A = 2 cos2 A – 1. Substituting 23° for A, cos 46° = cos 2(23°) = 2 cos2 23° – 1 = 2(cos 23°)2 – 1 = 2z 2 – 1. 3. If sin x = A, find cos 2x in terms of A. Using the identity cos 2x = 1 – sin2 x, you get cos 2x = 1 – A2. You may be expected to solve trigonometric equations on the Math Level 2 Subject Test by using your graphing calculator and getting answers that are decimal approximations. To solve any equation, enter each side of the equation into a function (Yn), graph both functions, and find the point(s) of intersection on the indicated domain by choosing an appropriate window. 4. Solve 2 sin x + cos 2x = 2 sin2 x – 1 for 0 x 2 . Enter 2 sin x + cos 2x into Y1 and 2 sin2 x – 1 into Y2. Set Xmin = 0, Xmax = 2 , Ymin = –4, and Ymax = 4. 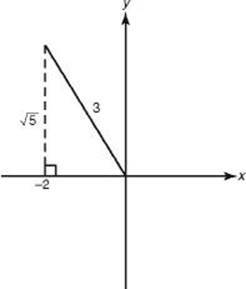 Solutions (x-coordinates of intersection points) are 1.57, 3.67, and 5.76. 5. Find values of x on the interval [0, ] for which cos x < sin 2x. Enter each side of the inequality into a function, graph both, and find the values of x where the graph of cos x lies beneath the graph of sin 2x: 0.52 < x < 1.57 or x > 2.62. 1. If sin and cos , find the value of sin 2x. 3. If cos , find cos 2x. 4. If sin 37° = z, express sin 74° in terms of z. 5. If sin x = –0.6427, what is csc x? 6. For what value(s) of x, 0 < x < , is sin x < cos x? 7. What is the range of the function f(x) = 5 – 6sin ( x + 1)?